Twenty-six year old Lou loses her job waitressing at her small-town cafe. Though she attempts to find another job, times are tough and she doesn't qualify for much. She soon finds a job as a caregiver for a quadriplegic, Will Traynor, who is rude, critical, and unhappy. She can't quit like all the caregivers before her because her family truly needs the income she brings in. Over time, Lou and Will develop a bond that functions on the edge of Will's pain and hardships. And if Will can see outside of his own pain, he might be able to see that Lou has some of her own. This book will make you cry. It is interesting, heartwarming, and heartbreaking at the same time. Interesting enough, about three of the girls in our book club have significant others who are quadriplegics so it was interesting to ask them about the accuracy of the details described. I enjoyed how Ms. Moyes was able to make it easier to understand I knew little about and make it interesting at the same time. The facts were integrated in such a way that I didn't feel like it was jargon or dry. I also enjoyed Lou and Will's interactions with each other. Half of the book club thought Will was condescending which made them enjoy the read less. I think there was a feel that Will was trying to better Lou and it seemed as if he felt only he could do it. I didn't think of it that way until they mentioned. No one in the book club enjoyed the ending. Based on the description I didn't think I would enjoy this one but man this is a good one. I think I need to try this one. Great review. awww!! i have seen this one everywhere, but didn't know that much about it. I adored this book. I thought it was genuinely sweet and touching. 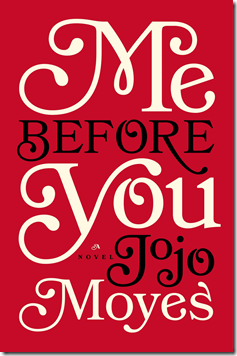 I like Jojo Moye's writing style usually, and this was such a page turner to me. This is on my audio list for this year. I enjoy her books and everyone has liked this one. Although it's made everyone cry too. Can't wait to listen to it! I wish my bookclub would read something this good. Lol. I still don't think I've gotten over this book. I'm so glad I read it, but oh man, so freaking painful. Definite ugly crying at the end.